Do y'all remember McDonald's Salad Shakers? They came in a cup like the McFlurries and you drizzled your packet of dressing and shook that sucker. Those were my favorite food to get at McDonald's for the longest time. My favorite flavor (gotta tie this in! ): CAESAR! The grilled chicken caesar - oh my goodness, can we just drool collectively and wish McD's would bring those back already?? So tying in with today's recipe - the reason I put this one in my hoarded pile of recipe was because of that salad shaker. I haven't had anything Caesar dressing flavored since my last shaker. I don't really understand why because I like Caesar dressing, but perhaps it's because I only eat French dressing and it has to be the kind that tastes like French dressing NOT Western/Catalina dressing. Anywho...these sandwiches were so moist and tender. So juicy. So addictive. I wish I had four stomachs like cows do...I would fill them up with these sandwiches. 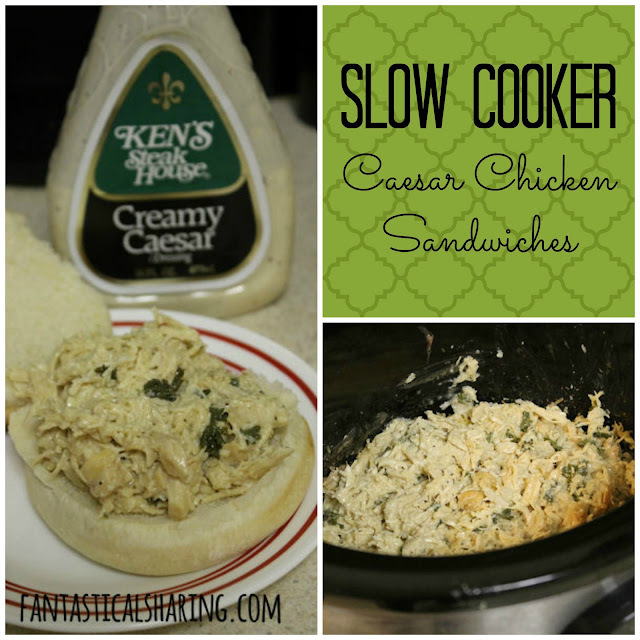 Place chicken into crockpot and cook on LOW for 6 to 7 hours. Shred and drain off any juices leftover in crockpot. Add dressing, Parmesan, parsley, and pepper. Cook on HIGH for 20 to 30 minutes or until heated through. Serve on buns with lettuce, if desired.